Plan your vacation by searching our comprehensive list of Minnesota Resorts. From ice and open water fishing and hunting to just relaxing and taking it easy, start your plan for your family vacation here! Visit Minnesota Resorts in our directory. If you would like to add your Resort or Lodge, please go to Add Your Link and we will add it to this page. Enjoy our central location near great fishing, restaurants, golf, casino.... Named one of Minnesota's "Nine Great Family Fishing Getaways" by Minnesota Sportsman magazine, Everett Bay Lodge has a variety of cabins sure to fit your needs. We have offerings for groups as small as one or two and as big as 15+. Our cabins include reserved docking with a paved boat ramp and paved roads all the way to the resort, making it safe and easy to bring your own boat, OR rent one of our many options. 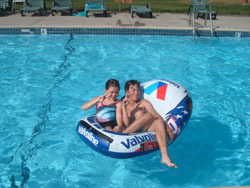 And, if RELAXATION is what you are after, our heated swimming pool, sauna, plentiful water toys such as hydro bikes, kayaks, canoe...provide plenty of outdoor options for all ages. Lake Vermilion is well known for its walleye, small & large mouth bass, muskie, northern, perch...and the Canadian shield lake offers a great alternative to crossing the border up north. We run special rates during the times when things quiet down a bit. Check us out at www.everettbaylodge.com. - just outside Detroit Lakes, Minnesota - between Pelican Lake, Wildflower Golf Course and a lot of trees. Fair Hills Resort has everything you remember. You can come and be a kid again, or you can come and enjoy a family vacation from the grown up perspective, with an easy round of golf or a day at the beach, and let the kids be kids in a welcoming and inclusive atmosphere. Big Foot Resort is located on 19-acres with almost 1000 feet of shoreline along Lake Mary. We have a small store with groceries, bait, licenses, souvenirs, and more. Water recreation includes swimming, fishing, boating and water-skiing & nearby recreation includes golf, tennis, hiking, bicycling, horseback riding, snowmobiling, downhill and cross-country skiing, and hunting. The resort is on a groomed trail for snowmobiling, and also offers great ice fishing on Lake Mary.